Put the onions and olive oil in a deep sauté pan and place over a medium heat. Fry the onions, stirring occasionally, until lightly caramelised and golden. Stir in the tomato paste. Add the carrots and stir for a minute or so. Take off the heat. Drain and rinse the lentils. Put in a saucepan. Add ½ litre water and bring to the boil over a medium high heat. Reduce the heat to low. Cover the pan and simmer for 15 minutes. Add the lentils and their cooking water to the carrots and onion. Season with the Aleppo pepper and salt to taste. Cover and simmer for another 15 minutes, stirring occasionally. Uncover the pan, raise the heat slightly and boil gently for 2-3 minutes until the excess liquid is completely evaporated. Cover with a clean kitchen towel and let cool if you are going to serve it war or at room temperature. Mix the yoghurt with the crushed garlic. Add salt to taste. 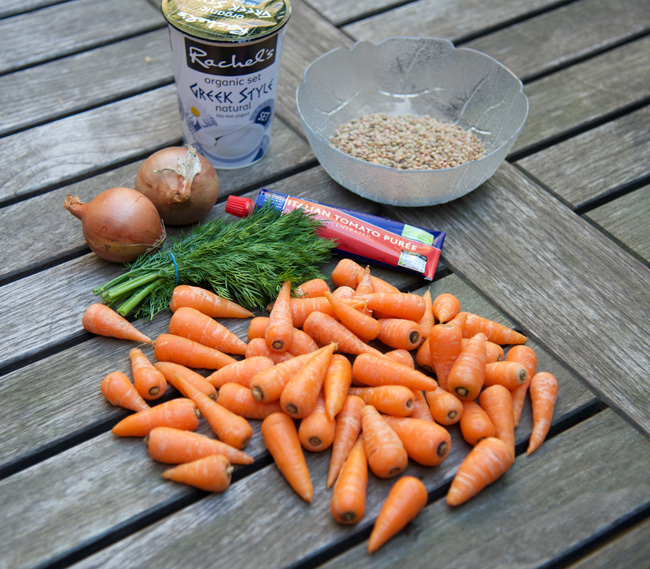 Then transfer the carrots and lentils to a shallow serving dish. Spread the yoghurt over the top, but without covering it completely. 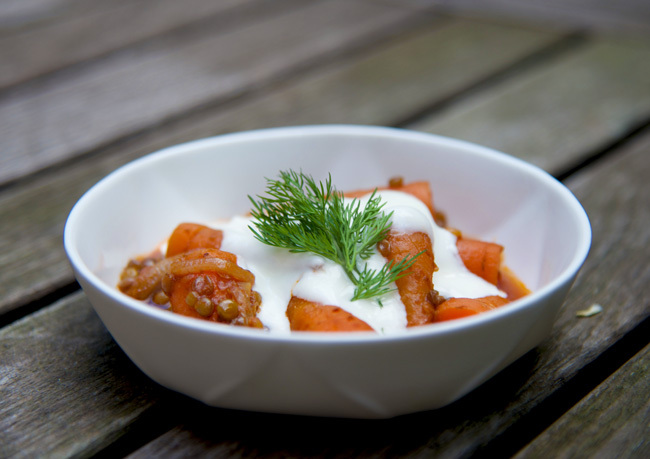 Scatter a few sprigs of fresh dill over the yoghurt or sprinkle a little dried mint or oregano. Serve with good bread. lovely im sure…will try. ty….there is very similar dish eatan in Jordan /Palestine but with pumpkin ..its pretty much the same but instead of carrots , pumpkin… and the pumpkin is lightly fried first..yahteen bil addas.. .scooped up with good khubiz and a squeeze of lemon and some good olives on side.. I discovered your website today by performing a Google search for Lebanese 7-Spice recipe. I am so happy I chose to look at your information first! I’ve been looking at some of your recipes and find them fascinating and I’m really looking forward to trying them.